Book Northern Lights Super Jeep Tour in Iceland! Northern Lights Super Jeep tour! Thule Travel is proud to introduce our new and exciting deluxe northern lights tour with our ever so popular Super Jeeps. You will experience the northern lights in a unique manner since we brag about having the best northern lights guides in the country! You will be picked up at your hotel or nearest bus stop and we will let you know when we´ll be there (pickup time depends on the month). It will be though between 20:00 – 22:00. Then the search begins, and our tours experts have been researching for that night where the best chances are to see northern lights. You will be entertained all the time, and hear stories and knowledge about all you ever wanted to know about this phenomenon, Iceland and just feel free to ask anything. Then we go northern lights „hunting!” The northern lights are a natural phenomenon so they are a little unpredictable. But no worries, if you don´t „catch“ them that night, you are always welcome to come again until you will see them. The tour is approximately four hours long. The Super-Jeeps are extremely comfortable and are equipped with WiFi and A/C. You can also charge your phone in the jeep if it runs out of battery! We offer blankets if you get cold, but the super-jeeps are of course always warm and cozy. During that four hours time, we will search for the lights and we offer a nice and friendly atmosphere which you will remember from your trip to our nice little country. We will stop and offer a shot of the traditional Icelandic Brennivín (exact translation is fire-wine!) and cocoa if you are not into that stuff. Then we offer you the Icelandic donut, kalled “kleina” and is like a donut, but with a twist. Very delicious! Group Size: No limits on the number of persons for the standard Northern Lights Tour but there is a maximum of 18 for the deluxe tour. Photoshoot: On our Northern Lights Tour, we offer our guests the opportunity to have a photo taken of themselves with the Northern Lights in the background. We will post those photos to our Facebook page but they can also be sent to an e-mail address if you prefer. In fact, these are free of charge as well as being our gift to you, a souvenir. Participants are responsible for their actions and Thule Travel does not assume any responsibility for accidents that are caused by its customers or can be traced to their own actions. 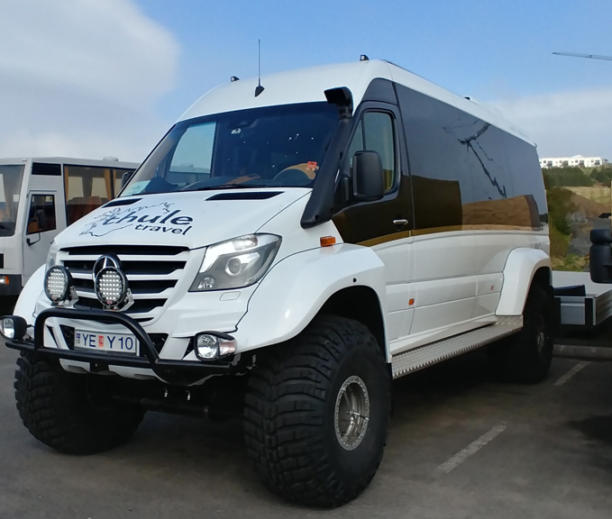 If a tour is requested again, you might not be able to go on a super jeep if it´s not available, but a regular Sprinter.